Bone broth can be literally just bones cooked in water. However, I make my bone broth with bones and vegetables (I think it’s the chef in me) I like the depth of flavor. There is also some growing thoughts that suggest combining bones with vegetables creates a synergistic effect, resulting in a healthier broth. I suspect that is true and it sure helps with creating your signature flavor. I believe strongly that food is thy medicine and follow the teachings of Weston A. Price and lady named Sally Fallon. Sally is a huge fan of using animal parts like feet and neck that might be hard to get. 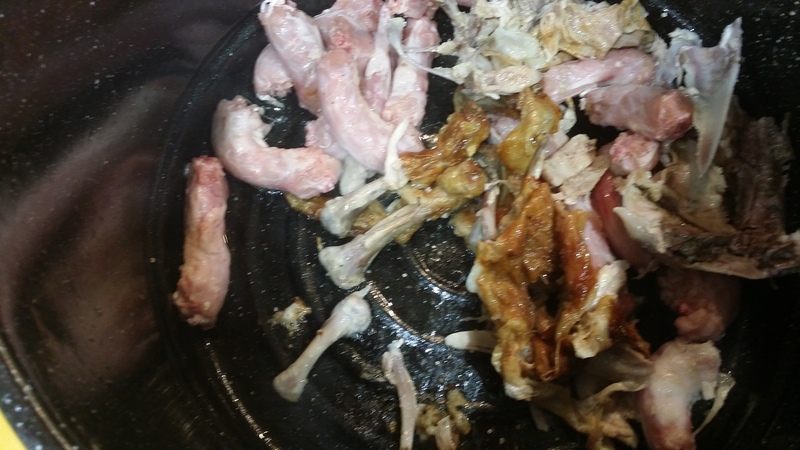 Try if you can, I normally can find neck but have issues finding a clean source of chicken feet. The chef in me also likes the idea of browning the bones and vegetables before adding the water and aromatics (parsley stalks, pepper corns, bay leaf). This adds richness to the finished product that I really love. And when you are sipping your broth you can really tasted the difference. Additionally I add some raw apple cider vinegar (with the mother). Be careful not to add too much water, you just want to cover the bones and vegetables. What if you are a vegetarian/Vegan? Well there is a mineral broth to suit you too. When I need a vegan broth my go to is from Rebeca Katz. Rebeca Katz and her Magic Mineral Broth. Enjoy it’s a winner and loaded with great healing minerals. Simmering Chicken Bone Broth. Used all sorts of extra vegetables for deep flavor. Adding in Vegetables and herbs to the start of the bone broth. Making your own bone broth can be deeply satisfying. 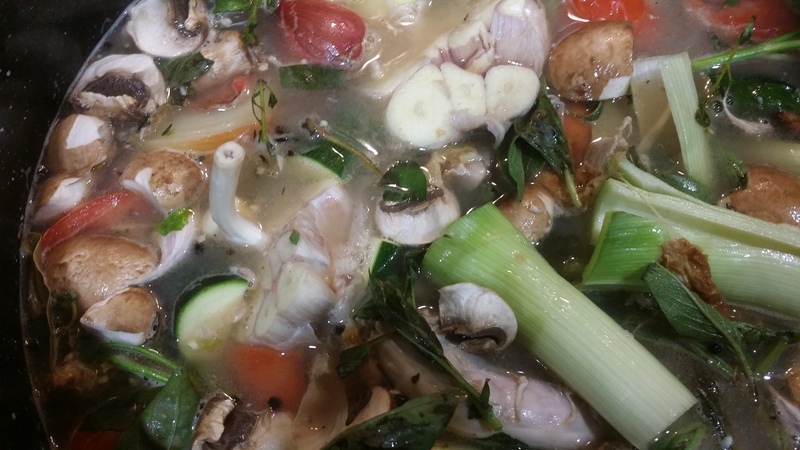 I use my broth to cook with - saute vegetables and as a base for soup as well as beverage. I also add a little to my dog, Chloe, bowl. She really loves it and I get the bark reward from her. •	Optional: 1 bunch of parsley stalks, 1 teaspoon peppercorns, 1 to 2 bay leaves. You'll also need a large stock pot to cook the broth and a strainer for the finished product. 1. 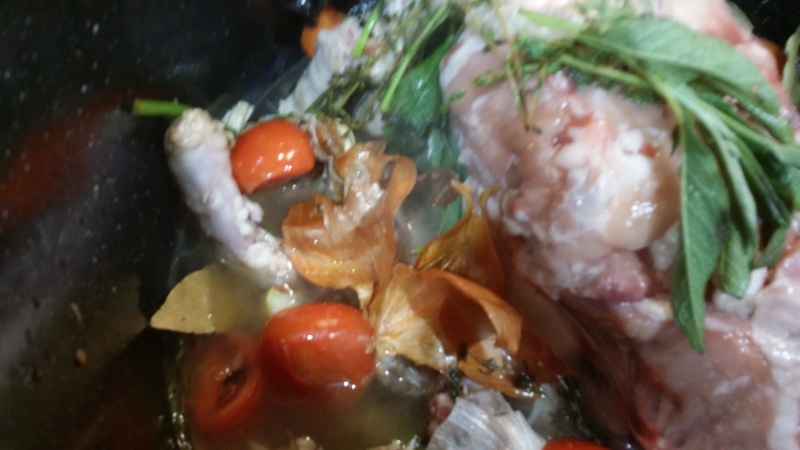 If you are using raw bones, especially beef bones, it improves the flavor to roast them in the oven first or you can brown them in the pot you are planning to make the broth in. If you use the oven then place them in a roasting pan and roast for 30 minutes at 180. 2. Then, place the bones in a large stock pot (I use a large lobster pot I purchased in Boston years ago). 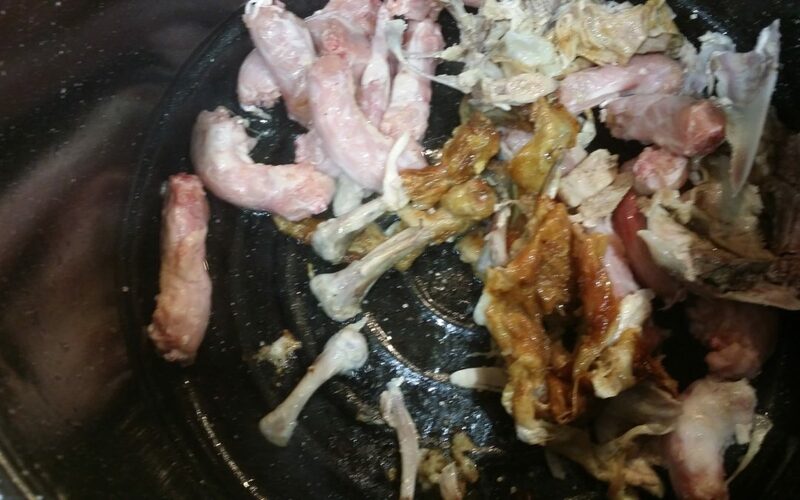 Pour water over the bones and just cover them and add the vinegar. Let sit for 20-30 minutes in the cool water. The acid helps make the nutrients in the bones more available. 3. Rough chop and add the vegetables, no need to peel the onion or garlic. If you have any vegetables like mushrooms and tomatoes they also add great flavour. 4. Now, bring the broth to a boil. Once it has reached a vigorous boil, reduce to a simmer and simmer for 24-48 hours. If you are scared to leave on your stove, then you could use a slow cooker. I have a metal ring I place over my gas burner that spreads the heat source and reduces the chances of the pot boiling over. 5. During the first few hours of simmering, you'll need to remove the impurities that float to the surface. A frothy/foamy layer will form and it can be easily scooped off with a big spoon. Throw this part away. I typically check it every 20 minutes for the first 2 hours to remove this. Grass-fed and healthy animals will produce much less of this than conventional animals. 6. Remove from heat and let cool slightly. Strain using a fine metal strainer to remove all the bits of bone and vegetable. Bone broth is rich in minerals that support the immune system and contains healing compounds like collagen, glutamine, glycine and proline. The collagen in bone broth helps to heal your gut lining and reduces intestinal inflammation. Additionally, collagen supports healthy skin, and the glycine helps to detoxify your cells from chemicals and improve brain function.